I don't know about those of you who participated in this challenge, but I thought this was extremely fun! It definitely brought back a lot of childhood memories. However, I feel like there are still so many books from SHELF DISCOVERY that I didn't get around to reading. I have a big box in my basement with about 20 more books that I have collected over the past six months that I still want to read. 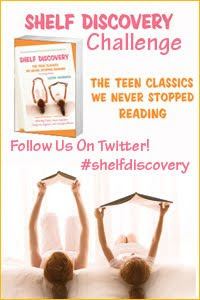 So...I have decided that I will be starting a SHELF DISCOVERY 2 Challenge come fall (probably September!) I am hoping that many of you will want to "play" again, and I'm also hoping that I will also attract some new participants. In the meantime, I have another fun challenge which is officially starting tomorrow. It's the 2010 EW Summer Book Reading Challenge. You can read about the details here. It's a fun, no-pressure challenge (perfect for summer reading) and the books look terrific. I'm hoping you'll consider joining. You only have to sign-up for 1 book -- how easy is that? Just a little reminder: I have a post where you can link to your Shelf Discovery Challenge wrap-up. You can add your link anytime, but please try to do so by May 15th because I will be selecting the winners the following day! I want to personally thank you for this challenge. It was SO much fun. It really brought back the best parts of my youth! You totally rocked at this challenge! Way to go! I acquired all 6 books then read none of them *sobs*. On the plus side, I'll already have them to try again in the fall!